Based on that statement, one could be quick to assume it was referring to defective technology or to an error in a system. This quote is in reference to transgender individuals in the U.S. military. On Jan. 22, the U.S. Supreme Court voted to allow the Trump administration’s policy on restricting military service to transgender men and women. Reading some of the comments being made about the results of the vote, it sounds as if a huge issue has been solved. When in reality, there was no problem in the first place. With the Pentagon’s official statement saying that this will “ensure the most lethal and combat effective fighting force,” it makes one wonder why these statements are being framed in such an offensive way. 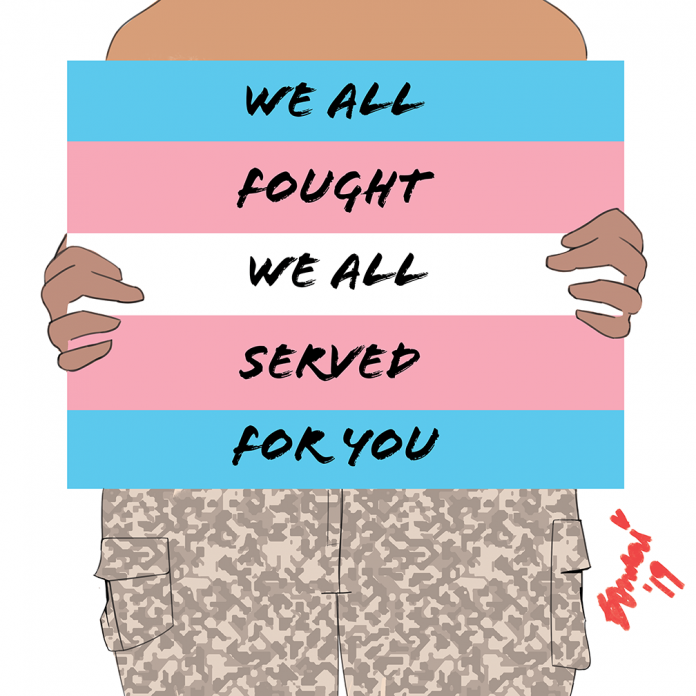 The transgender men and women who are signing up for the military and willing to risk their lives deserve better than to be treated in a way that makes them out to be a shortcoming. Transgender people were allowed to serve freely without hiding who they were since the policy change on July 30, 2016. Now, this new policy looks to build that wall of restrictions back up. This is all reminiscent of the “don’t ask, don’t tell” discussion from almost a decade ago, a policy that forced gay and lesbian soldiers to hide their homosexuality for fear of being discharged. It’s disappointing that people are barred because of who they are. It shouldn’t matter to any government if someone wants to be with a man or a woman nor should it matter what someone’s gender is. Transgender people are willing to be there for their country and to hold respect for the flag that they wish to support, end of the discussion. This transgender military ban isn’t “to ensure the most lethal and combat effective fighting force,” which the Pentagon cited as one of its reasons for the ban. It’s taking discrimination and a social bias against a group of individuals and trying to normalize it. It’s a shame to allow a policy that disregards an entire group of people based on gender. The amount of transgender individuals in the military may not be the majority, however it shouldn’t matter. Discriminating against one person is bad enough, raise that number even by any amount and it only gets worse. This policy would effectively reduce the rights of a specific demographic of people. The official statements coming from the Defense Department even take the chance to add statements that appear as targeted attacks with the use of the phrases like “to ensure the most lethal” or “poses a risk” which only undercuts the validity of the argument. By saying that restricting transgender people will help the military improve, it’s creating an adverse effect and inaccurately labeling the transgender community as weak. It’s trying to say it’s not OK to be transgender or they are not “normal” enough to serve their country. Everyone deserves freedom to serve, but more importantly, they certainly deserve respect. © Copyright Tarrant County College — The Collegian. All rights reserved.